The University of New England, Australia's first regional university, is built around one of the nation's most magnificent country houses, Booloominbah — one of the many buildings designed by John Horbury Hunt and now listed by the National Trust. UNE graduates have indelible memories of graduation ceremonies on the lawns of Booloominbah overlooked by this masterpiece of nineteenth-century domestic architecture. F.R. 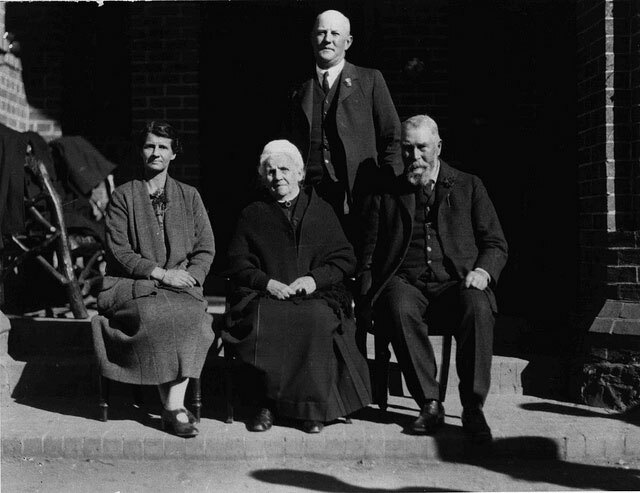 White seated with members of his family in the 1920s outside Booloominbah, with John Horbury Hunt (standing). John Horbury Hunt one of the foremost architects of his day, designed Booloominbah for Frederick Robert White. It was conceived as a 'gentleman's house' that would reflect White's status as a community leader and successful pastoralist. F.R. White was the great uncle of Australia's Nobel-Prize-winning novelist Patrick White. Born in Canada and trained in the United States, Hunt had settled in Sydney in 1863. Over the next 30 years he designed and built cathedrals, churches, chapels and houses in Sydney and regional NSW that are among the most outstanding of their time. In the 1870–80s, F.R. White was involved in planning and financing the construction of several Hunt-designed churches in and around Murrurundi. He also engaged Hunt to design a new shearing shed for his Harben Vale sheep station. Having decided to build a family home on land near Armidale that he had bought in 1880, he commissioned Hunt to draw up plans for the grand house. The contract for the building of Booloominbah at a cost £6,000 was signed in March 1884. Hunt found inspiration for Booloominbah in the 'cocktail' of English architectural traditions — including those labelled 'Gothic Revival' and 'Queen Anne' — that was, at the time, influencing domestic architecture in America. This movement embraced Gothic arches and brick buttresses together with wooden wall shingling, gables, tall chimneys, and small-paned windows. Hunt's buildings incorporating this hybrid complexity of form are remarkable for the overall harmony of their design. On entering the house from the car park through the imposing archway of the entrance porch, you'll find yourself in the main hall. A striking feature of the hall is its fireplace, which is surmounted by a tall oak mantelpiece of 'Gothic' design. Looking up, you'll see the unique Gordon window (pictured), which forms a dramatic backdrop to the main staircase winding up from the hall to the first-floor landing. 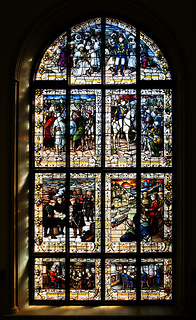 This large window, recognised as the most outstanding example of domestic stained glass in Australia, comprises seven scenes from the life of the Victorian hero General C.G. Gordon (known as 'Gordon of Khartoum') — from his entering the Royal Military Academy, Woolwich, at the age of 15 to his death leading the defence of Khartoum in 1885. There are many panels of stained glass in the windows of Booloominbah — more than in any other house designed by Hunt. Portraits of Shakespeare and Sir Walter Scott adorn the windows of the library, the day nursery windows are alive with stained-glass illustrations from children's books, food-related images illuminate the dining room, and allegorical human figures and pictures of Australian animals and birds appear in windows throughout the house. The glass for the Gordon window was made by leading craftsmen in London. All the other stained glass panels in Booloominbah were made in Sydney.